I don’t know about where you are, but it’s been absolutely roasting here in sunny Devon this weekend – and what better timing to kick of National Barbecue Week (May 30 -June 5). Barbecues are one of my favourite parts of summer. There’s something about the sun beating down on you while you eat overly chargrilled food which makes you feel so… good. Maybe it’s the warmth in the air, the smell of summer or just the damn good food, I don’t know. But what I do know, is that coming up with a gluten free barbecue doesn’t have to be difficult. If you have coeliac disease, you may already know a lot of burgers, sausages, and pre-marinaded barbecue meats are pretty much a no-go area. 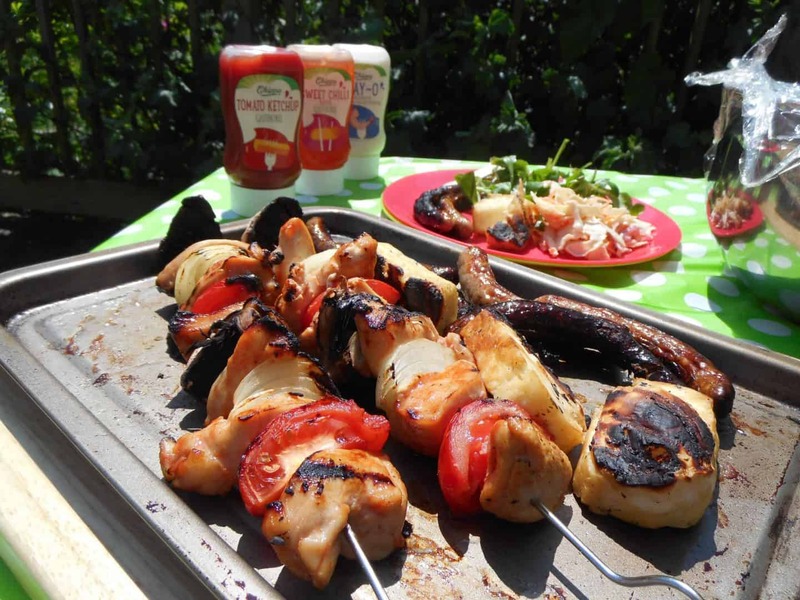 But I’ve teamed up with free from condiments range Chippa to show you barbecues can be just as much fun if you’re gluten, dairy or egg free. To mark National Barbecue Week I came up with two recipes for your perfect summer occasion – some tasty sticky chicken barbecue skewers and some egg-free coleslaw using Chippa’s egg free May-O. I honestly can’t tell this is egg free at all, it’s great! If you’re serving up a barbecue for a coeliac, you also have to be careful of cross contamination. The idea situation is to make sure everything is gluten free (you can buy so many gluten free burgers and sausages as standard now!). Failing that, make sure you have a separate section of the barbecue if it’s big enough, with separate tongs – or if it’s too small cook the gluten free food first. As for sides – salads, gluten free bread, grilled halloumi, coleslaw – they all make fantastic additions, and Chippa provides a free from condiments range everyone can dress their food with and enjoy. Chop the chicken into large-ish chunks and place into a Pyrex dish of large bowl. To a bowl add the ketchup, sweet chilli sauce, Worcester sauce, honey, olive oil and salt and pepper to season. Mix well. Pour the marinade over the chicken and mix until coated. Leave to marinate for a couple of hours – or ideally overnight. Quarter the tomatoes. Peel the onion and quarter it. Quarter the mushroom. Once the chicken had marinaded, arrange the chicken, mushroom, tomato and onion pieces evenly onto large, metal skewers. Grill on a hot barbecue, turning regularly, until the chicken is completely cooked through – around 15 minutes depending on how good your BBQ is! Serve with salad and thick slabs of grilled halloumi cheese – delicious! Finely slice the red onion and the cabbage and grate the carrot. Add the veg to a large mixing bowl along with the May-O and salt and pepper. Stir until fully mixed and refrigerate until needed – it’s really that simple! This post has been sponsored by Chippa, the free from condiments range. Chippa sauces are available from Morrison’s and Sainsbury’s. Find out more about them here. Previous Post May favourites: Coeliac Awareness Week, weddings, BodyPower and my birthday!